We have “Spin The Wheel Instant Gift” for our Junction Customers. It will be started from 23th Aug to 2nd Sept in our Five Junction Centers including Junction Nay Pyi Taw! 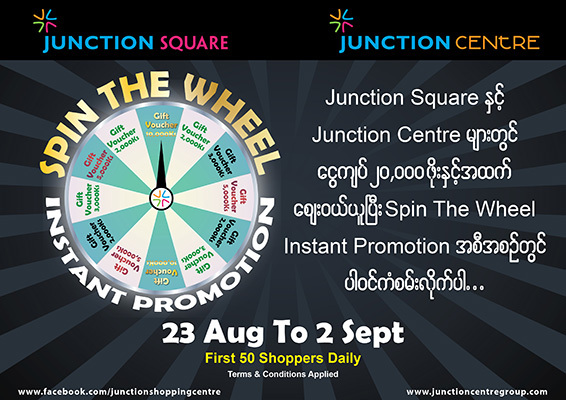 All you need to do is purchase at any shop at participating Junction Centre for 20,000ks (max 4 receipts combined with at least 5,000ks per receipt) and you can spin the Lucky Wheel at once. Enjoy shopping with Junction and let’s get a chance to win an instant gift at Junction Centers.